When you send a proposal to a prospect, would it be good to know what aspects of the proposal they were interested in? Absolutely! I want to show you how you can do this using Google Analytics tracking codes. I use this technique in every proposal I send out and it helps me during the sales process. Let me step back first and talk about what makes this all work. Almost every business has Google Analytics active on their website. This gives you information about visitors to your website and what they were looking at (more posts on that later). A little used feature of Google Analytics are campaigns. If you run a lot of online marketing campaigns, like ads, you would use this to measure the effectiveness of each ad. You can use this built-in feature for much more than ads. Any link to a page on your website can use a campaign link. So what I do is set up a campaign name for each proposal I send out. I include links in the proposal to more detailed information on my website that a prospect might want to review during the decision making process. Whenever a prospect clicks on one of the links, Google Analytics records that the visit to that page came from a specific proposal. Now I know within 24 hours what topics the prospect is interested in. I use this for more than proposals. I include coded links in the emails I send after my workshops with additional resources for the participants. Within a week, I can see which articles or videos they clicked on and in a followup call with the client we can discuss what areas they may need additional training in, based on the actual needs demonstrated by their staff. 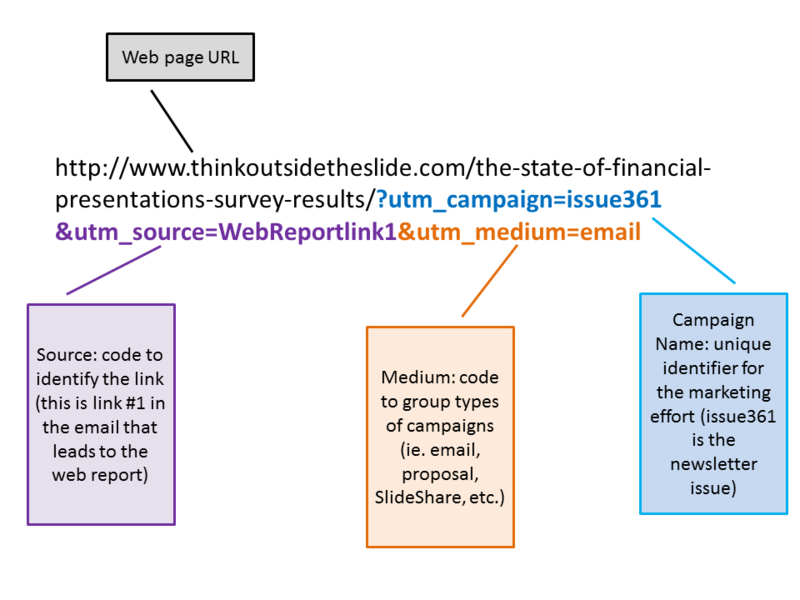 I include coded links in SlideShare presentations so I can see what information people were interested in as they viewed the slides. I have also used coded links in PDF documents and on special reports on my website. Tracking actions is better than guessing what people are interested in. Campaign Name: a code that uniquely identifies this marketing effort. For newsletters, I use issue360, issue361, etc. For a SlideShare deck I might use a code like 3BigFinancialMistakesDeck. Make the code meaningful so it is easy to recognize when looking at your analytics reports. Source: a code that uniquely identifies the link that is being clicked. I suggest numbering links if there are multiple links to the same page in a single email or document. For example, if I had two links to a web report, I might use WebReportlink1 and WebReportlink2. This way, I know which of the two links generated the most action by the reader. Medium: a code that identifies the type of campaign. This is not reported well in the reports, so I generally just use simple categories such as email, newsletter, or SlideShare. The link can get long, but the link still works and it doesn’t change how fast the person sees the content on your site. It gives you additional information that allows you to make better decisions about how effective your marketing efforts are. Google has more complete documentation on using campaigns here and a URL builder tool that you can use. 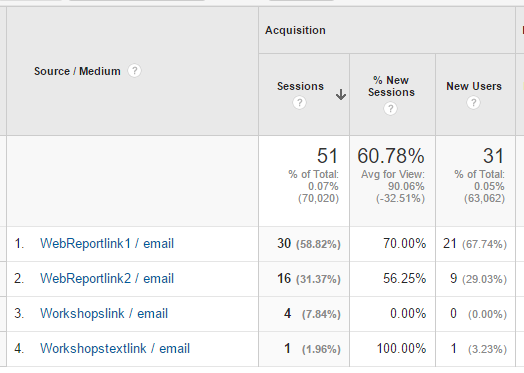 After you start using campaigns, you can view the campaign statistics in your Google Analytics reports. Under the Acquisition menu, you will see the Campaigns link. When you are looking at your campaigns, the default is to organize by the campaign code first. Here is what the top of my campaigns screen looks like. I can see how well each campaign did in terms of number of clicks, how many pages they viewed after clicking the link, and how much time they spent on my site in that visit. I have seen that visitors who come to my site via one of these links stay longer and view more pages than those that come via a web search. When you click on a specific campaign, you see which links people clicked on. Here is my screen for the issue 361 campaign, which was issue 361 of my newsletter. Clearly, the links to the web report were the most popular of these links, with over 80% of the clicks from this newsletter to that report. It also showed that the first link in the newsletter was almost twice as popular than the second link. In the past I have seen the popularity of links indicate that topics on using Excel data were popular and I was able to focus more on those topics in my writing and speaking. In my discussions with other business owners, I have found few who use Google Analytic campaigns in this way to track the popularity of topics in proposals, documents and other materials. Consider how you can leverage these links in your business.